Dr. Anthony Fauci, director of the National Institute of Allergy and Infectious Diseases, was in the Glass Enclosed Nerve Center Monday, Sept. 29 to answer questions about enterovirus 68, Ebola, this year’s flu season and more. WASHINGTON - The National Institutes of Health's infectious diseases chief tells WTOP that there is no chance for an Ebola outbreak in the United States but it is possible that an infected patient could show up at one of the nation's many emergency rooms. Dr. Anthony Fauci, director of the National Institute of Allergy and Infectious Diseases, says that strict protocols that call for isolating Ebola patients would help prevent the spread of the deadly virus here. An American doctor, who was exposed to the disease while volunteering in Sierra Leone, was admitted Sunday afternoon to an isolation unit at the NIH's Clinical Center in Bethesda for observation. The doctor, who is at risk of becoming ill, will be observed to determine whether or not he or she develops an infection from the virus. If not, the patient will be released. But if the patient becomes sick, the person would be treated. The doctor's presence poses no threat to the medical campus or the community, Fauci says. 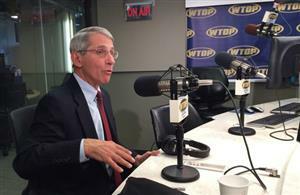 Fauci spoke about the Ebola outbreak and the NIH's response during WTOP's "Ask the Doctor" program Monday. The current outbreak of Ebola in West Africa has infected more people than all past outbreaks combined since the virus was identified in 1976. So far more than 6,500 people have been infected and more than 3,000 have died. Those numbers could reach the million mark if more isn't done to help, Fauci says. Past outbreaks have ranged from a few patients to several hundred, infecting about 2,500 people total, he says. "The cold reality is, unless we dramatically increase the resources to be able to contain, isolate, do contact tracing, and appropriately care for people in the West African countries, the worst case scenario could be approached," Fauci says. He says that's the reason President Barack Obama called on the United Nations to step to the plate last week to help control the spread of the infection. "No one country is going to be able to do it. It has to be a global effort." Meanwhile, the NIH's years of Ebola research has resulted in what Fauci calls a promising vaccine that is currently undergoing human trials. Twenty volunteers have been injected with a both a low- and high-dose of the vaccine at the Bethesda medical center. They'll be under observation until early December to make sure the vaccine is safe. The next stage would be a large scale test of the vaccine to determine its effectiveness at protecting individuals against the disease. Those tests would have to be completed in areas where Ebola is circulating, and that means it can't be tested in the U.S., Fauci says. NIH has been working to test vaccine candidates since 2003. Unitl now, pharmaceutical companies have shown little interest in developing an Ebola vaccine because there was no financial incentive, he says. But a proven vaccine won't be available soon enough to halt the spread of the current outbreak, he says. That's it for "Ask the Doctor." Thank you for joining us. The full audio and a story will be posted shortly. The alcohol based sanitizer... are they as good as hand washing, better, or worse? On the HPV vaccine: Boys and girls should be vaccinated. If the boys are vaccinated, they can't spread the virus to girls. thanks so much -- we'll be referring them to the CDC website for information in support of the importance of handwashing! We appreciate imporance of handwashing, but there is a lot of administrative resistance to requiring -- even providing opportunity for -- handwashing. Even after the recess that comes right before lunch. Any tips on helping to communicate this important public health common sense behavior (hand washing) to school personnel? The measles vaccine is one of the most effective vaccines ever developed. It's a very serious disease and is completely preventable. Education campaign in West Africa covers: Those sick with Ebola should not be taken care of in their own home because they could infect relatives. They should be taken to a hospital or community care center. Also mourners can be infected by handling the bodies of the dead during funerals. Current outbreak has 6,500 cases and about 3,000 deaths but all previous outbreaks affected just 2,500 people. On the ethics of testing medications on desperate people in poor countries: Vaccine testing to determine the the safety of the doses is being done on volunteers in Bethesda, Md., not West Africa. To prove that it works, the vaccine must be tested where there is disease - that means Africa, not D.C.